Professional wrestling loves easily digestable stereotypes. Good guys vs. bad guys in an exaggerated battle, with even more exaggerated personalities. And to save time coming up with those personalities, sometimes they're just ethnic caricatures - even modern promotions rely on the "evil foreigner" trope, even when the performer has no real tie to the nationality he's playing. That one's been around, forever, too: back when wrestling was more of a carnival sideshow than an organized event, there would often be "cowboy vs. indian" matches, with the natives being played by whoever had the best tan. However, there have been some actual Native Americans inside the ring, such as Christopher Chavis - better known as Tatanka. Tatanka is a Lakota word that means "buffalo" - as you may be able to guess, WWF introduced this guy shortly after Dances With Wolves was a major hit, because that's when white people learned the word, and if there's one thing you can say about Vince McMahon, it's that he is a white person. Chavis is a member of North Carolina's Lumbee Tribe, who would be pretty far from the Lakota's home in North and South Dakota. Plus, Vince dressed him up like a 5-year-old's idea of what an "indian" would look like: giant headdress, war paint, everything. He even did a war dance when he came to the ring! It'd be the equivalent of having someone from Greece dress up as a viking and do an Irish step dance, then calling him "European." But to their credit, they didn't try to paint Tatanka as a savage unfamiliar with the modern world: he was just a proud warrior, and dressed that way to honor "his people." Tatanka has a very serious look on his face, and at the time this toy represents (1993), he'd stopped wearing the facepaint, so we don't get any of that. He does, however, have the dyed red streak on the top of his mullet - a feature which allegedly represented "the blood of all the indian nations combined." Sure, thanks Vince. In his television debut, Tatanka defeated Pat Tanaka in a match that had to be very confusing to call. Heck, just typing that sentence was tough, imagine having to scream their names live! Anyway, in that debut, the announcers actually went out of their way to explain Tatanka's "grab-bag" design - they told us what nation he was actually from, before pointing out the Apache and Cherokee symbols on his ring gear and the Sioux origin of the name; you really get the feeling he told them "if you're going to dress me up like a cartoon, you're going to explain why I look like this." By '93, his outfit had gotten even more cartoonish, adding a loincloth, fringe on the boots, feathers tied around his biceps, and big, patterned wraps around his forearms. He's also wearing the beaded necklaces that were part of his entrance gear, but that is a removable piece - everything else is permanent (and the bracers are just painted on). The gear is all brown, blue, and red, and makes for a nice ensemble. He'd competed as a bodybuilder before turning to wrestling, so Tatanka gets a fairly defined body - not the most ripped on Mattel has in its library, but definitely more muscular than average. He moves like the rest of the Elite Collection figures, with joints at the ankles, shins, knees, thighs, hips, waist, torso, wrists, elbows, biceps, shoulders, and head. His finishing move was the Indian Death Drop, a thematically renamed Samoan drop - pick your opponent up in a fireman's carry, fall backwards to slam them on the mat. That one's simple enough that pretty much any wrestling figure will be able to get in position for it! 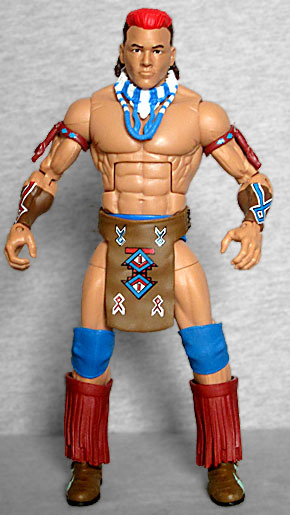 Tatanka didn't get his feathered headdress until 1994, so this figure doesn't include it. But lest you think that the figure has nothing stereotypical to carry, worry not! 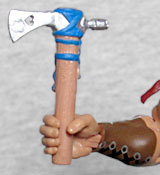 He often carried a tomahawk to the ring with him, so this figure includes that as well. His right hand is shaped to hold it, while his left hand is open wider. 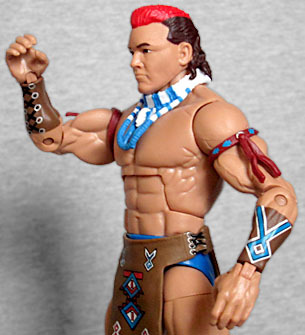 Tatanka was part of Elite Series 47, which is when the figures began coming with a small plastic stand and a cardboard "build-a-diorama" backdrop - buy all the figures in a given series, and you'd get a big wide scene to stand them in front of. The backdrop for Series 47 is the entrance ramp and the Titantron, and despite being listed as figure "A," Tatanka's piece goes second from the right. By itself, it just kind of looks like some colorful stripes, not anything specific, but that means it'll work okay even if you don't buy the other five figures in the series (Asuka, Kevin Owens, Cesaro, AJ Styles, and Big Bossman). Although he was popular, Tatanka never managed to win any titles in his time with the WWF - supposedly he was meant to get the Intercontinental title at WrestleMania IX, but for whatever reason that didn't happen. The back of the packaging lists his "career highlight" as winning a Slammy Award, but it fails to mention his career lowlight: being involved in an interminably drawn-out angle with Lex Luger that was meant to be an allegory for Vince McMahon's steroid trial.